The Amish are a sub-group of the Christian Mennonite Church, originally formed in Switzerland in the late 1600's. In the 18th Century, many Amish and Mennonites emigrated to Pennsylvania, which is now considered the largest Amish community in the world. The Amish are known for simple living, plain clothes and detachment from modern technology and society. The Amish speak Pennsylvania Dutch (a dialect of Swiss German) and their population is about 250,000. The Amish place high value on humility, composure and community; rejecting pride, vanity, and self-promotion. According to the Amish interpretation of the Biblical Commandments, they are not allowed to have graven images i. e. have their pictures taken and/or displayed. I was told it was OK to take photos from far away as long as their faces aren't shown. It was actually difficult to avoid them, they kept popping up in my viewfinder, so for this post, I'm limiting my photos to the most respectful ones, like the boy and the bicycle, below. Arriving in Lancaster, LeeLee and I were a bit "underwhelmed" at first. 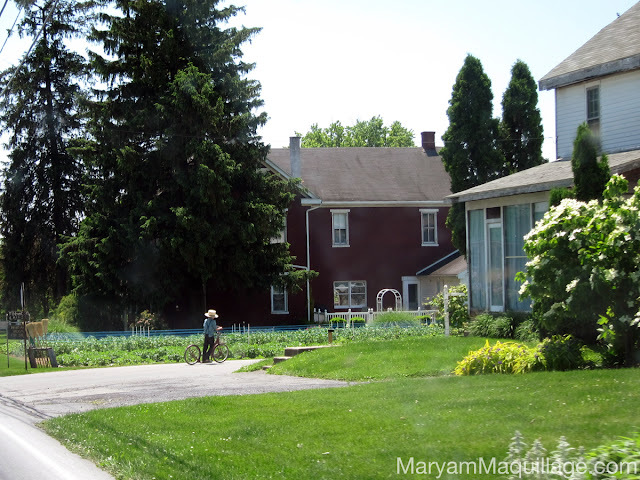 The peace, ease, and tranquility of the Amish Village and its residents were too loud of a silence for city dwellers like us. As most tourists, we came in with our own predispositions, judgements and modern attachments (I was tweeting and IG-ing through my buggy ride smh). It was only after meeting Susan, a non-Amish tour-guide at the Amish Farm & House, that we began to understand what this culture was all about. Susan was incredibly knowledgeable and sincerely passionate about the Amish and their traditions. 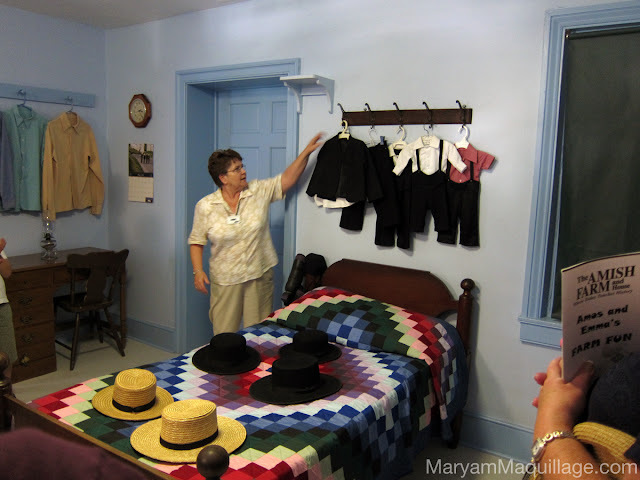 She guided us through the historic home giving us a crash-course in Amish lifestyle and culture. It was one of the best history lessons I've ever had! 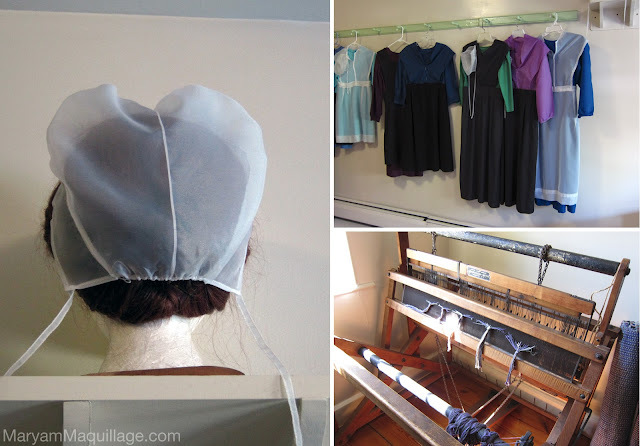 Amish home decor and clothing is all about modesty and humility. There are no buttons, adornments, decorations, or jewelry. The girls own two to three dresses with aprons: 1 or 2 for every day and another for church. Since this culture is about collectivity and not individuality, there are no variations in style or clothing, other than the distinction that can be made between married and single persons. For example: a man grows a long beard after he gets married, so it's very easy for the girls to see who is available. Married women, on the other hand, wear a white heart-shaped bonnet to church on Sunday. In fact, a man would have to wait until Sunday to find out if the girl he has his eye on is actually available. I kind of like this practice! In a society that seems so strict, there are absolutely no arranged marriages. In order for a young man to court a girl he likes, he must ask permission from the girl's father and she ultimately has to give the OK for the father to report back to the young man. So, the dad is essentially the daughter's wing-man! Simply genius!! 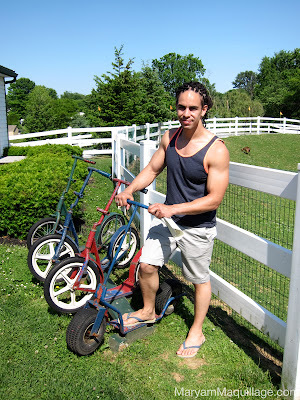 Here I am, checking out some textbooks (printed by an unofficial Amish-supported publishing house) and LeeLee, modeling the parked scooters outside of the one room school. The cutest thing was seeing the children actually ride these scooters!! 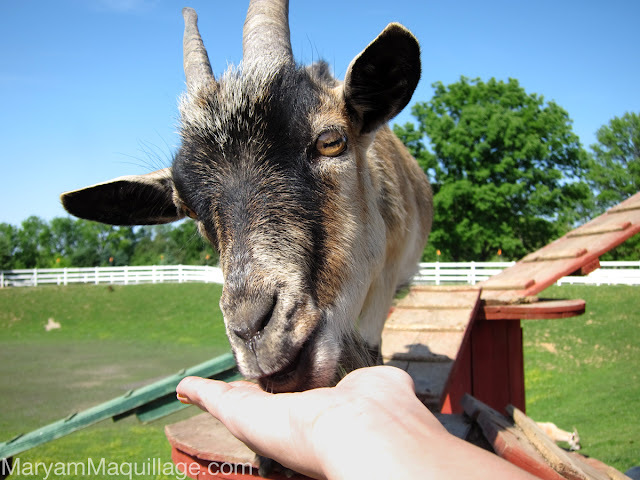 I love animals, so I was totally at home on the farm :)) P. S. goats have really funny, horizontal pupils... I never noticed them before!! After the restaurant, LeeLee and I drove around checking out some Amish "real estate"... Driving through the little roads, we came face-to-face with a two-seater buggy holding a young couple. The guy did not have a beard, yet he was grinning from ear to ear. At that moment, LeeLee and I caught eyes and smiled: we knew exactly what was going on in that buggy: she gave the OK!!! I sense a ♥-Shaped Bonnet in her future!! 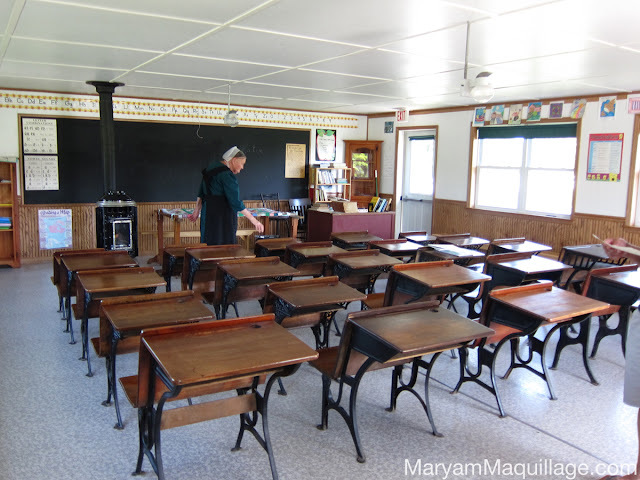 *There are many misconceptions and misunderstandings about the Amish culture and also a whole lot of fascination and curiosity. 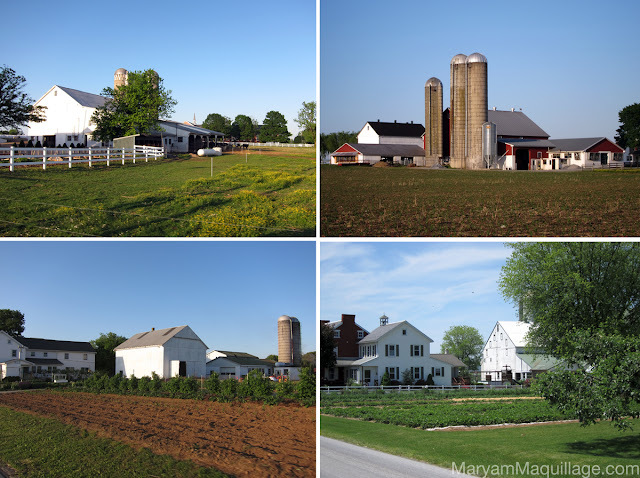 Most people visit the Amish Country to gawk at the people who "live in the past", neglecting the fact that this is a closed society, often treating the Amish like zoo animals. At the same time, tourism is essential to the Amish, given the fact that they can no longer rely on subsistence farming as a main source of income, nor do they accept government assistance. If you decide to visit the Amish, please be mindful of these existing parallels. Very nice photos!! I always think it's interesting to hear a little bit about a bloggers private life....not the whole thing, but a little bit makes me always even more curious!! Good job lady. And still sooo pretty without alot of MakeUp! OmG sweetie your pictures are really cute i love it your post! wow love it a totally different side of you very interesting great pictures! How breathtaking. I've lived in Lancaster for about 2 months, i remember not wanting to leave. Although most areas are very conservative, i felt very welcomed. Enjoy your travel!! YOU have a great blog! Loving your posts and style! Hope you are having a wonderful day! Woww everything looks amazing <3 Nice pics honey! What an incredibly (in every sense of the word) interesting post! 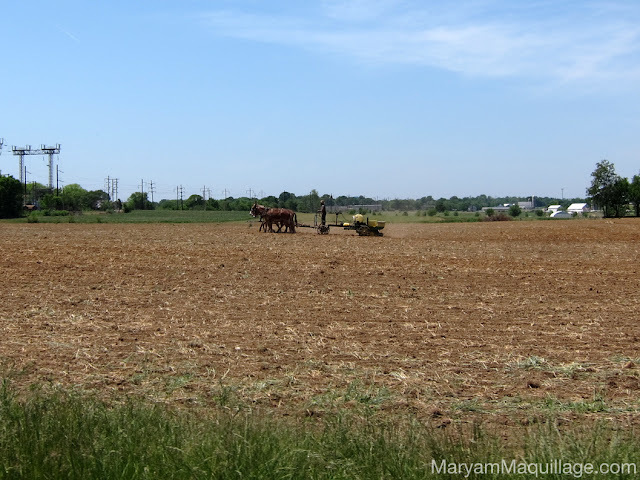 I get fascinated by other cultures and worlds unknown so was completley absorbed in this post learning about the Amish through your experience. I know they're not allowed to listen to music either which always blows me away - I love this new little direction your blog is taking though. I love your make up posts, always have, but I do love learning about other peoples lives and experiences through their blogs. Hope you had a lovely weekend. Hiii you trips looked fun i live in scranton is more city " but not really but you had fun ! Wow great post, Maryan!!! beautiful photos!!! An incredible experience in Amish country ! thanks for sharing these lovely and charming images. And you are sizzling in all the buggy shots. that is so cool you got to experience to amish community! I like this different post of you. Nice photos and information! You are so well spoken! Or well written? Lol either way I loved this post as it was informative and curious yet respectful. I love this post a lot. Aww Ami you are always so sweet :)) Thank you doll... I think I'm better written than spoken, I speak too fast and don't edit lol... thank goodness there's editing in writing!! Great post! I'm fascinated by the Amish, so I would love to go visit Lancaster! your so lucky to be able to travel and experience this things!! gives you such a different perspective on how other people choose to live!! love it sugar!! !